Donald Trump's campaign chairman Paul Manafort has resigned from his position on the campaign, the Republican presidential nominee said in a statement Friday. "This morning Paul Manafort offered, and I accepted, his resignation from the campaign," Trump said. "I am very appreciative for his great work in helping to get us where we are today, and in particular his work guiding us through the delegate and convention process. Paul is a true professional and I wish him the greatest success." A Trump source said Manafort told Trump he was becoming a distraction and he wanted to end that. With just under three months to go until Election Day, Manafort's departure reflects the shifting power centers on the Trump campaign: After consolidating influence and discarding with Trump's campaign manager Corey Lewandowski, Manafort has now found himself on the outs after Trump elevated two different aides to senior positions on Tuesday: Breitbart News chief Steve Bannon as campaign CEO and Kellyanne Conway as campaign manager. It's the second high profile departure from the top of Trump's campaign structure after campaign manager Corey Lewandowski left the operation earlier this summer. A new campaign manager and executive were named earlier this week. he departure also comes as Manafort is defending himself from investigations into his extensive lobbying history overseas, particularly in the Ukraine, where he represented pro-Russian interests. Manafort has been beating back reports from multiple media outlets in recent days over his ethics, which have been egged on by a Clinton campaign eager to highlight Trump's ties to the Kremlin. A pair of Republican congressman have also called for investigations into Manafort's business past. "I want to know what money he got from a pro-Russian organization in the Ukraine," Rep. Sean Duffy of Wisconsin told CNN's Chris Cuomo on Tuesday. "I think Donald Trump ought to really investigate this and where his chief adviser, what his association with the Russians are," Rep. Adam Kinzinger of Illinois told CNN's Jake Tapper earlier this week. Trump and his running mate Mike Pence are in Baton Rouge, Louisiana, this morning, touring flood damage and meeting with residents there. Manafort, a longtime Washington fixture, was originally brought on in the spring to save Trump from a defeat at the Republican convention should Trump have failed to win enough delegates to clinch a first-ballot nomination. Yet his role grew to serve as Trump's connection to the GOP establishment, telling Republican elders that their presidential nominee would run a traditional campaign that would not imperil down-ballot candidates. After warring behind the scenes for months with Lewandowski, who had little regard for Manafort, Lewandoswki was fired earlier this summer. That decision by Trump seemed to be an embrace of Manafort's strategy. 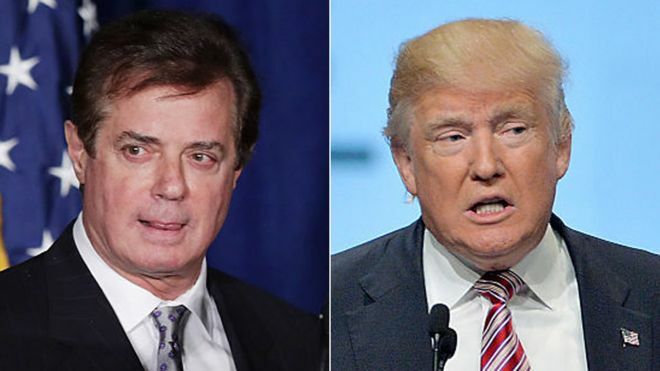 Manafort installed many of his associates in the upper echelons of the campaign, signaled his support for an allied super PAC and crushed attempts to embarrass Trump at the Republican convention in Cleveland. Yet as his poll numbers tumbled, Trump decisively reversed course, installing a media provacateur -- Bannon -- as his campaign's CEO. Manafort's role had been diminished, and Bannon is expected to encourage Trump to embrace the hyper-aggressive attitude that won him the primary. Trump's son Eric said Friday that while Manafort had been instrumental in steering the campaign through the GOP convention, the former chairman's business past had begun to detract from his father's messages. "I think my father didn't want to be, you know, distracted by whatever things Paul was dealing with," Eric Trump told Fox News' Maria Bartiromo. "You know, Paul was amazing. But again, my father just didn't want to have the distraction looming over the campaign and quite frankly looming over all the issues that Hillary's facing right now." Lewandowski said Friday that he had nothing to do with the change, but said it marked a much-needed course correction before Labor Day. "Well, look it's obviously a difficult thing for anybody when they change jobs and have a position that they've been so invested in for a long time and really put their heart and soul into something, to not be part of it, particularly when you're this close," Lewandowski told CNN's Kate Bolduan on "At This Hour." "But what the most important thing is is this is a reminder to me and the American public that Donald Trump will do anything it takes to win." You can read more here on CNN.